We are now exactly ten years since the bottom in March 2009. 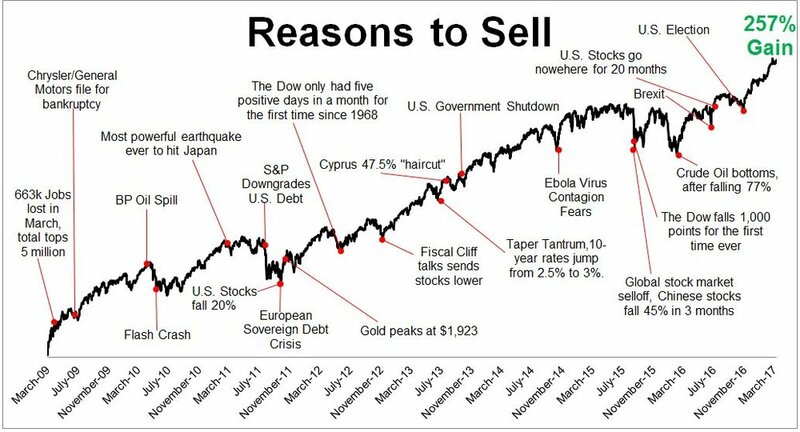 If this chart were to be updated, it would show a 320% gain. The S&P 500 is just a couple of percent off the high reached in September last year after a rapid bounce that started just before Christmas. A lot has happened in the last ten years, and I can’t do a better job of narrating the advances than Brian Wesbury of First Trust. This piece describes how the world would look to you if you had fallen into a deep sleep the day the market bottomed in March 2009 and just woken up. It would be almost unrecognizable to you – for the better. What’s fascinating is how research shows that people don’t feel better. The reason for this is partly built into our psychology. Our brains respond differently to bad news versus good news, and there are two main reasons why. The first is something called loss aversion. “Losses loom larger than gains”. Studies have shown that the pain of losing is about twice as powerful as the pleasure of gaining. Losing $100 feels twice as bad as gaining $100 feels good. As Jimmy Connors, the legendary tennis player said, “I hate to lose more than I like to win”. The second bias at play here is the fact that the more easily can you recall something, the more likely you estimate it to be. It’s a simple rule of thumb that your mind unconsciously uses to assess probability. More memorable things seem more probable. And guess what? We have an evolutionary instinct to be more attuned to bad news than to good news, because responding to bad stuff is literally what kept our ancestors alive. Surviving for them was about responding appropriately and quickly to possible bad outcomes. A rustle in the undergrowth? Maybe it’s a lion. Responding to good things in life was far less urgent. A rustle in the undergrowth? Maybe it’s a lion…. This is called the availability bias. It explains why we irrationally worry about shark attacks and terrorist attacks – they are very memorable events when they occur and we hold onto them in our minds thinking they are more probable than they are. How does this have any relevance to investing? Well, our brains want us to overreact to a threat, because that threat could turn out to be the difference between life and death. Of course, in modern day life, we don’t often find ourselves in life or death situations, but our brains don’t know that. Our brains evolved in a world that is many times more dangerous than the one we live in today. All of those points on Batnicks’ chart above feel like a threat and the only thing your brain really knows to do with the information is to panic. The media makes it even harder for us. Bad news always leads, because it is by definition, news. It is something that happened, not something that didn’t happen. There is an unpleasant rule in the programming world – ‘if it bleeds, it leads’. The goal is always to grab your attention. If you want to start to imagine where we could be in ten years and the sorts of companies that could dominate, I highly recommend listening to this conversation between Shane Parrish of Farnam Street and Josh Wolfe of Lux Capital. Josh believes the best way to predict the future is to invent it, and he is busy doing just that. Being a pessimist will sporadically feel good. When the market falls you will feel vindicated. Ha! I was right you will say. You have had plenty of times to say that during the past ten years, and will have plenty more in the next ten. But your wealth and your life will suffer for it. David Brooks of the New York Times wrote in a 2016 opinion piece, “The biggest threat now is unmerited pessimism itself, and the stupid and fearful choices that inevitably flow from it”. Brooks wasn’t specifically talking about investing, but this is perhaps one of the truest statements about people and their money in 2019.